Zwerl is an app that lets people get answers via chat on 150+ topics. And each topic has people working part-time behind the scenes to answer the questions. That’s why Zwerl is actively hiring now. 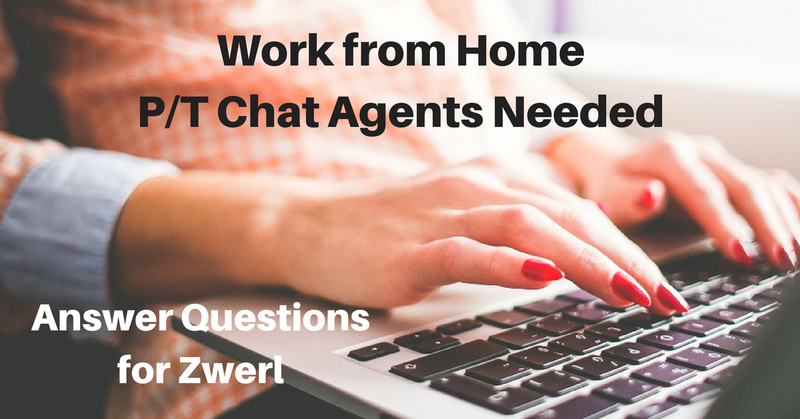 You can work from home and set your own schedule, Zwerl says. No state hiring restrictions are mentioned. Pay information has been hard to come by. But for reference, a recent ad for a Zwerl math expert quoted $8 to $16/hr. Per one of our FB members, the pay is by minute for time spent answering questions. This hasn’t been confirmed by the company but we’ll post here when we have more details. Zwerl says its topics include “pretty much everything.” A sampling includes cooking, dating, fashion, fitness, movies, travel, do-it-yourself categories, personal finance, math, coding and translation. But there are many more. It’s hard to say how many openings Zwerl has and in which topics. Lately, Zwerl has been advertising for people who know about pets, movies, men’s fashion, wine, job interview tips, New York, betting, electronics, C++, math, marketing and more. But since the app is growing and applying looks pretty simple, you might want to give it a try if you’re interested in a part-time chat job. Also, don’t be discouraged if your skill category isn’t listed on their signup form for experts. Zwerl has been advertising for topics that don’t appear on the form. This entry was posted in Chat Jobs, Part-Time Jobs, Work at Home Jobs and tagged Zwerl. Bookmark the permalink.